All across the universe, the Doctor is hailed as a hero, a benevolent force, the man who fights the monsters, topples the dictators and frees the oppressed. Repercussions demonstrates an alternative side to this. What if, whilst doing these good, even great, deeds, the Doctor is unwittingly changing the Web of Time. Giving people knowledge they're not supposed to have. Empowering races that should have remained in the dark ages. Overthrowing the evil that, had it continued to flourish, might ultimately have brought together a greater force of good to eradicate itself. Established writers of Doctor Who books and audios are joined in this collection by fresh talent and new voices. repercussion n. : 1: (often followed by of) an indirect effect or reaction following an event or action. 2: the recoil after impact. 3: an echo or reverberation. The galaxies are awash with stories, myths and legends of the Doctor, the courageous Time Lord who rights wrongs and brings down the evil dictators. But does the Doctor always get it right? In his efforts to save the smaller picture, is it possible that occasionally the bigger picture, the Web of Time itself, can be broken by his actions? If so, what can he do to repair it? 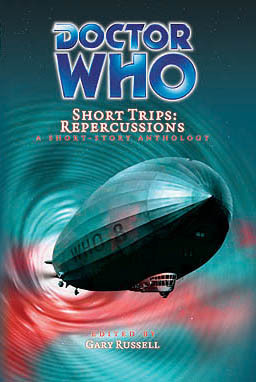 Repercussions features sixteen tales set on a strange airship taking its passengers on a trip to... who knows where? Amongst the people aboard is young adventuress Charley Pollard, just a few weeks into her life aboard the TARDIS alongside the Eighth Doctor, a man whose past, she will discover, she knows frighteningly little about. She encounters a diplomat trying to stop a war, a young man seemingly murdered by the Doctor, a tramp, a seismologist and a republican trying to save the life of his plague-stricken daughter. One thing they all have in common — an encounter with a strange alien visitor who seemed to help them but perhaps should have left them alone. Learning their stories, understanding their grief, their anger or even their joy, Charley begins to see a new side to this enigmatic man she has chosen to travel the universe with. And she is forced to ask, will she one day also find herself aboard a strange airship, teeming with fellow travellers, all of whom seem to represent a danger to the Web of Time?